The Smithsonian Museums make Washington DC a travel destination even if you don't care anything about it being the U.S. Capital. ...Maybe a couple of weeks to see them all... talk about museum overload! Most are scattered around Washington DC. Together they comprise one of the finest collection of museums in the world. ...But seriously, they're all worth seeing. 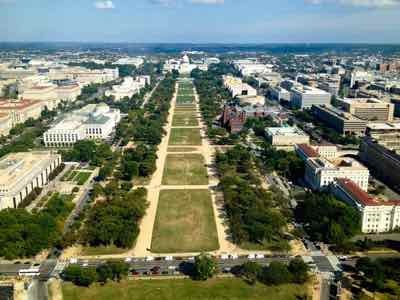 Ten of the museums are located right on or near the National Mall. They are strung out for about a mile on both sides of the Mall between the Capitol Building and the Washington Monument. You'll do a lot of walking within the museums too, so be sure to wear comfortable shoes. Remember that the hop-on-hop-off buses are an option for getting around to the different museums. There is food available in several of the buildings. The iconic building of the Smithsonian Museum is the "Castle". This red sandstone building was the Smithsonian's first building. It's centrally located on the Mall. There really isn't much to see here, but it's a good place to start because it's the Information Center for all the museums. One of the most visited of all the museums is the National Air and Space Museum. It displays many historic aircraft and spacecraft. There are full scale models of a Lunar Lander and rockets. The Imax Theater offers different films on flight several times a day. If you like airplanes, get out to the Steven F. Udvar-Hazy Center near Dulles Airport in Virginia. There are many more aircraft out here. These two are probably right up there as candidates for Mark's two favorites. He does love airplanes! Another favorite is the National Museum of Natural History. It is well loved for its dinosaur exhibit and for the room full of precious stones including the legendary Hope Diamond. If you want to give your kids a real thrill, check into a Smithsonian Sleepover. You'll see the movie, "Night at the Museum", get to explore the museum, and sleep with dinosaurs! The National Museum of American History is the one that offers proof for the saying "The Smithsonian is America's attic." It's in the museum that you will find the "Star Spangled Banner." You'll find such diverse exhibits as inaugural gowns worn by President's wives all the way to steam trains. You'll also find Kermit the Frog and ruby slippers worn by Judy Garland in the "Wizard of Oz". The National Gallery of Art contains a great collection of Western European and American paintings. The Freer and Sackler Galleries have Asian art and American art with an Asian influence. The Hirshorn Museum and Sculpture Garden is a collection of modern art. Next to the building is an outdoor sculpture garden. Visit the National Museum of African Art and the National Museum of the American Indian to see and learn about the history of the native peoples of the Americas. There is a National Portrait Gallery, an American Art Museum, a National Postal Museum and the National Zoo. The National Archives Building is also on the Mall, but it is not a Smithsonian Museum. The Rotunda for the Charters of Freedom is the permanent home of the U.S. Declaration of Independence, the Constitution of the U.S. and the Bill of Rights. The Smithsonian Museums are open every day of the year except they are closed on Christmas Day. They are open from 10:00 a.m. until 5:30 in the winter. Most stay open until 6:30 or 7:30 in the summer. Check the Smithsonian website for details. Admission is free making visits to the Smithsonian a great bargain.